this sweet morsel forms on my tongue. I said I didn’t want to be that, a poet who whines about love, wines for love, grinding gyrations pestle-heavy, thigh-drunk. My wild waist; you, hemmed by riddims. Slipknots of breath unwound from us. We were dark silhouettes on a wall. I preferred you not lyrically shooting batty bwoys, sounding death and damnation. Savoured open-throated moans clamouring, laughs bursting like ripe plums. What strains at the seam, scuttles out from memory’s trapdoor is this: years later, Buju entrapped in Babylon, and you, telling me how you nearly forgot, but your voice broke into a gravelly chant when the bassline dropped, never know you woulda really feel so nice. Stovetop you lit, pot you coaxed me into, glinting flanks you kept gnawing from—what would not be severed from bones. Your mouth is a nest of marabuntas, every sunken stinger’s anchor dragging me back. Soyini Ayanna Forde is half Trini, half Guyanese and all diaspora. She has work in Moko, Small Axe, Apogee, Cleaver, and elsewhere. Her writing was deemed a notable essay in Best American Essays and nominated for a Pushcart. Her poetry chapbook, Taste of Hibiscus, is available from Dancing Girl Press. 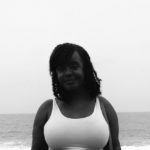 A graduate of the Stonecoast MFA program, she currently lives in Florida and blogs about West Indian culture, race, and occasionally, her love life at soyluv.wordpress.com/.